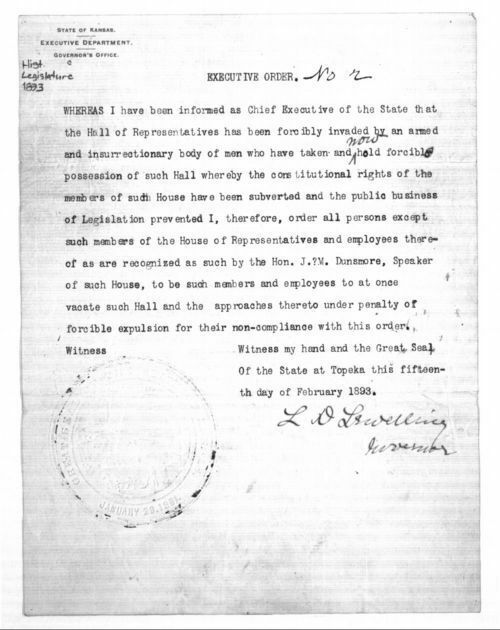 Kansas governor Lorenzo Lewelling issued this executive order in response to the standoff that would become known as the Legislative War of 1893. During this conflict, the Republican (Douglass) House and the Populist (Dunsmore) House both claimed to have been the legally elected House of Representatives for the state. Consequently, both attempted to conduct business in Representative Hall, ignoring the presence of each other and spending day and night in the chambers to prevent the other side from gaining control. On February 13, 1893, however, the Populists barricaded the hall while the Republicans were away, preventing the Republican congressmen from re-entering the chambers. The Republican house responded by battering the hall doors with sledgehammers and posting armed guards to protect the hall. At that point Governor Lewelling issued this order, demanding that the Republicans disband and "vacate such Hall and the approaches thereunto under penalty of forcible expulsion." The Republicans refused, and after a tense standoff, on February 25 the Kansas Supreme Court affirmed the validity of the Republican House, thus ending the "war." This source can be grouped with other documents and images pertaining to the Populist War, including photographs of the militia, Gov. Lewelling's directive to Colonel Hughes, the statement of the Republican house, the newspaper article about Lewelling's position, Jeremiah Remington's postcard, Floyd Bull's reminiscence, and the copy of the agreement that ended the standoff.